Etiquette and formal behavior are usually not regarded as traits associated with fighting, especially today. Politeness, sincerity of heart, self-control, self-sacrifice, and most importantly, honor, are all central to the standard of excellence a warrior should seek to attain within himself. The key word here is within. Although Bushido - literally "Way of The Warrior", was the title of a famous work composed by Inazo Nitobe in 1905, its conception dates back to thirteenth century Japan. 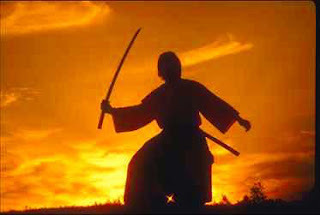 Bushido was a system of rules and customs that warriors, or more specifically, samurai, were supposed to follow. The code is strikingly similar to a concept to emerge in Europe at about the same time. Chivalry, practiced by medieval knights, encompassed a set of virtues nearly identical to Bushido. It was Chivalry that transformed the unruly knight into a new paradigm for the age - the gentle man, whereas in the East, the samurai began to exercise newly found restraint, poise and social decency. Bushido and Chivalry both provided a much needed civilizing effect on the warrior class.